Once in a lifetime one gets an opportunity to do something which gives joy to the giver and receiver at the same time. Therefore, it gives me great pleasure to introduce the author and compiler of this book - Mr. Jim Howie. He is the current President of the Australian Hibiscus Society and has been involved in the promotion and culture of Hibiscus long before he was elected President at the inaugural meeting of this society on October 10, 1967. During the past few years it has been my privilege to become associated with the hibiscus lovers of Brisbane. These are dedicated, unselfish, gentle people whose souls are reflected in the blooms they nurture and admire. When it was decided that all the knowledge gained over the past 12 years should be recorded for posterity, Jim Howie volunteered to undertake this mammoth task of classification of all the commercially known varieties originating from India, Sri Lanka / Ceylon, Hawaii, America, New Zealand, the Pacific Islands and Australia. It is only fitting that the beautiful bloom named "Jim Howie" bred by our own Queensland breeder, Stan Beard, and named in his honour be the bloom to grace the cover of this first publication. To our many friends and members and to the many others who will become enchanted with our "Queen of the Flowers" this book is offered to give you assistance and pleasure. The inaugural meeting of the Society was held on October 10, 1967. With the love of Hibiscus, the Queen of Flowers, at heart and a lot of work, this Society has grown to the highly successful and informative body that it is today in its service to the general public. As a member of the American Hibiscus Society, author and compiler of this book. I am eternally grateful to our friends of the American Hibiscus Society with whom our society is affiliated for their generosity and the information they have given me over the years, particularly the fact that they have allowed me to use articles and portions of articles from their educational book "What Every Hibiscus Grower Should Know", by courtesy of their Publication Department. To our Charter Patron, The Honourable Mr Justice J. A. Douglas and his good wife, Mrs. Douglas, who have given us their utmost support since 1967, thank you, both. Our Past President, Mr R. B. (Bob) Bennell, deceased, for his dedicated work for our society and Mrs Thelma Bennell, thank you. We are a friendly Society interested mainly in Hibiscus rosa-sinensis hybrids. Their beauty is endless and each year we see new and better varieties developed. Breeding of new hybrids in Australia has come a long way in the last 6-8 years and we now have many Australian Hybrids equal to anything in the Hibiscus world. I am proud to have been the Foundation President of this Society. I thank, from the bottom of my heart, the people who have helped me in their various capacities while writing and compiling this book. It has been a mammoth task as this book is the first of its kind ever printed in Australia. I started in August 1978 and completed it in January 1980. During this time I have processed approximately 650 varieties of established hibiscus and seedlings. My sincere thanks to my dear wife, Shirley, and sons, Timothy and Christopher, for the help and understanding given during this period of time. This Hibiscus book is informative, educational and a reference to growing Hibiscus, with a Nomenclature of varieties grown in Australia. It also includes 34 colour plates of Hibiscus. Ihope it is enjoyed by all who read it. How can one describe the beauty of hibiscus! The beauty of the flower is beyond the power of words to express or the mind to translate into definite thoughts. Whether we realize it or not, each of us hungers for the beauty which hibiscus can bring into daily living. The daily offering of magnificent flowers of many varieties and colours brings into each of our lives a joy of living which is beyond simple explanation. For this and many other reasons hibiscus are loved and cultivated in all tropical and sub-tropical countries. Many people are unaware of the broad range of hibiscus colours, colour combinations and flower forms, and think of hibiscus only as the single red flower that is so often seen. There is an almost unlimited variation in shades of colour. Hibiscus can add beauty to every garden and satisfy the tastes of any individual. The aim of myself and the Australian Hibiscus Society is to bring basic information about hibiscus to the reader and share with others the joy of this beautiful flower. The flowering of most plants varies in different sections of the state and country and with different varieties of flowers. Generally, blossoms are more plentiful during the period of most vigorous growth. Flowering season, for most varieties, is nearly the year round; some bloom almost constantly. However, some varieties do not bloom at all well during the winter months, while some flower poorly during hot weather. Colour shades will vary according to the weather, temperature, amount of sunlight and time of day. The flowers last longer in autumn weather than during the heat of summer with some lasting up to 3-4 days. With the first observation 3 or 4 colours may be evident but on closer examination and with the help of the R.H.S. colour chart (see Nomenclature readings) it can be established that there are often many more colour combinations present. There are many varieties of hibiscus with heights ranging from about 90cm-6m (3-20 ft). There are varieties that grow to a height to suit every situation. If you want a tall hedge, windbreak or a low hedge, there are varieties to suit these situations. Should you want a standard for a special feature which can be grown up on a single stem with a crown of weeping branches, this is also available. There are varieties that can be espaliered on a wall or fence. Others can be grown in pots or tubs for many years - in fact, there are hibiscus for every purpose. There are all sizes of blooms, and almost every colour imaginable, some having up to ten colour combinations. 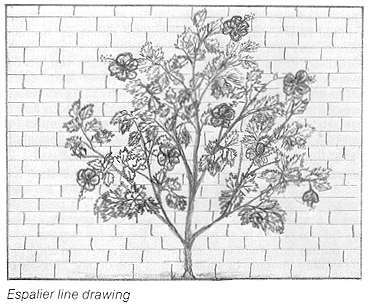 There are many varieties suitable for espalier work, including the following: Agnes Galt, Allen's Attraction, Bronze Wings, Boondah, Charlotte Keala, Copper Queen, Doctor Gillette, Estrella Red, Firefly, Florida, Isabelle Barling, King Lavender, Pink Cameo, Ross Estey, The Bride.